Today I am going to talk about the comparison between the Cisco Catalyst 9500 and Cisco 4500-X which is a fixed Core switches for enterprise networks. 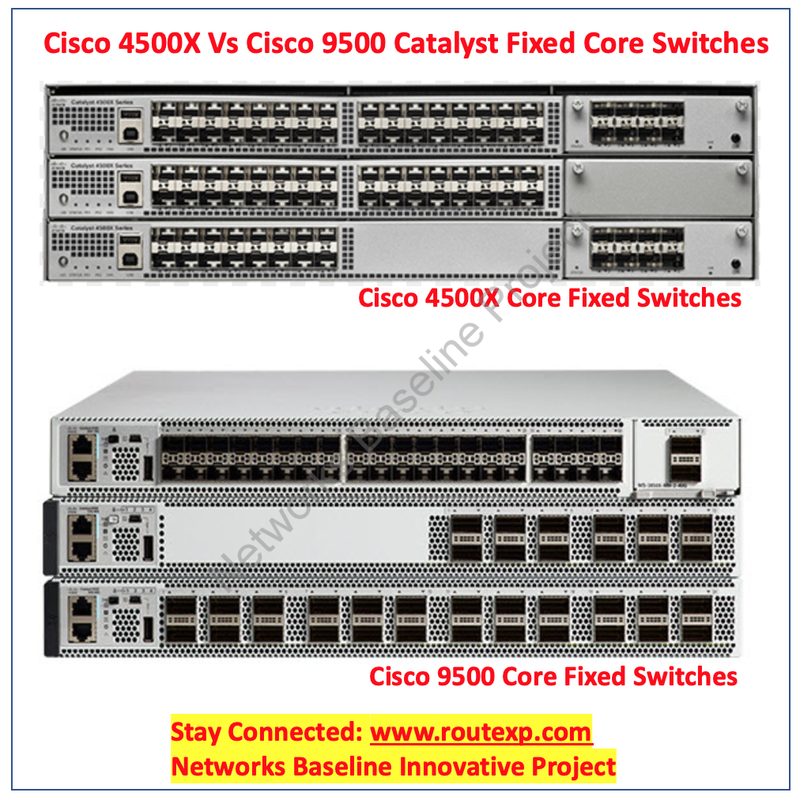 The newly come Cisco 9500 catalyst switch has more capability and features as compared to Cisco 4500X catalyst fixed model switches. As we earlier discussed on Cisco Catalyst 9500 chassis, it is meant for the new generation networks which includes to support the security, mobility, IOT and cloud-based traffic. Based on an x86 CPU, the Cisco Catalyst 9500 Series is Cisco’s lead purpose-built fixed core and aggregation enterprise switching platform, built for security, IoT, and cloud. Let’s talk about the chassis bandwidth of both the switches, Cisco 4500X will provide you up to 800Gbps of overall bandwidth on the chassis while if we talk about Cisco Catalyst 9500 switch, it will provide the significant much more capacity of 6.4 Tbps of overall bandwidth on the chassis. As both of these switches support 10G, 25G, 40G and 100G ports on the chassis. The maximum ports on Cisco 4500X will be 40 ports while in the Cisco Catalyst 9500 it will be 48 ports where you can get maximum of 100G capacity on to 32 ports. Cisco 4500X catalyst switch don’t have Native Flexible NetFlow while it is there in Cisco Catalyst 9500 witch. Similarly, Trustworthy Systems solutions are there on Cisco Catalyst 9500 switch which is not present there in Cisco 4500X switches. One another amazing feature which is there in Cisco 9K switches is Encrypted Traffic Analytics (ETA) which has not been there in Cisco 4500X catalyst switches. There are so many other features like Fabric-enabled Wireless, Common wired-wireless features, UADP ASIC for wired-wireless convergence, Application visibility across wired-wireless and Hierarchical wireless QoS which is not supported on Cisco 4500X switches while it is very much there in Cisco Catalyst 9500 switches. With the advance fabric solution in the campus named as SD-Access, Cisco 4500X is not able to be the part of Cisco SD-Access fabric next generation solution in the LAN network while Cisco Catalyst 9500 is the Edge core device used in the SD-Access as a fixed core solution. The Catalyst 9000 family is also the first in the line to proposition the Cisco IOS XE and Cisco DNA subscription-based software licenses, permitting customers to buying the qualities and abilities they need. With the Cisco Catalyst 9500 switches, you can create improved customer and employee experiences through higher performance and better-quality support for mobility and new applications which are there to support in Cisco Catalyst 9500 switches. Yes, regarding the cost comparison between these switches used for the core with reduced cost and complexity with Cisco SD-Access by automating and providing complete visibility into the wired and wireless access networks it is much better than the Cisco 4500X catalyst switches.